Reporters no longer beat a path to the modest white house just over the Caroline County border -- and that's fine with its owner, a soft-spoken 67-year-old who never wanted the fame her marriage brought her. Born Mildred Jeter, she's known mostly by the name she took when she -- a black woman living in segregated Virginia -- dared break the rules by marrying a white man named Richard Loving. The union landed the Lovings in jail, and then before the Supreme Court, and finally in the history books; 40 years ago Tuesday, the court ruled in favor of the couple, overturning laws prohibiting interracial unions and changing the face of America. 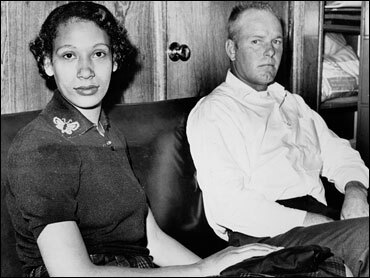 Mildred Loving is a matriarch to thousands of mixed couples now sprinkled in every city. But she hardly considers herself a hero -- just a girl who once fell in love with a boy. "It wasn't my doing," Loving told The Associated Press, in a rare interview. "It was God's work." While the rest of the Jim Crow South struggled to divide the races in the early '50s, blacks and whites in tiny Central Point had long been intertwined. They worked together on farms, raising chickens and tobacco. They drag-raced together. And often, they were intimate, explained Edward Clarke, who grew up in the town an hour outside Richmond, today little more than vast fields, ragtag homes and weed-choked farm houses. Standing in the hilly cemetery where Richard Loving is buried, he swept his hand out over markers reading Jeter, Byrd and Fortune -- black folks, he explained, many so pale they could pass for white. "The white people were just like the black people," said Clarke, himself a black man with clay-colored skin and stick-straight hair. "You lived and survived ... it was a sharing thing." It was in this setting that a skinny 11-year-old nicknamed "Bean" met a 17-year-old boy who was a family friend, according to Phyl Newbeck, a Vermont author who detailed the case in the 2004 book, "Virginia Hasn't Always Been for Lovers." Over several years, friendship led to courtship -- but their relationship took an abrupt turn when an 18-year-old Mildred became pregnant. "We're talking the early '50s, when an illegitimate child was far more of a stigma," Newbeck said. "I don't think Richard wanted her to have to bear that." And so, they drove some 80 miles to Washington, D.C., in 1958, married, and returned to Central Point to start a new life. "I think he thought (if) we were married, they couldn't bother us," Mildred said. Within a month, they were in jail. Now 84, Garnett Brooks vividly recalls bursting into the Lovings' home at 2 a.m., rousing the couple out of their sleep and hauling them off to face the law. Word of their marriage -- nobody's sure who complained -- had reached the commonwealth's attorney. "He told me to go and check on them and if they are (married) arrest them," said Brooks, who insists the case wasn't about race, but about illegal cohabitation. "I told him I'd be glad to do it." A 28-year-old Phil Hirschkop was just a few months out of law school when he overheard a professor discussing the Lovings with another lawyer, Bernard Cohen. It was 1964, and the Lovings had spent the past few years living in exile in Washington after being convicted on charges of "cohabiting as man and wife, against the peace and dignity of the Commonwealth," according to their indictments. Laws banning racially mixed marriages existed in at least 17 states. The couple had avoided a year in jail by agreeing to a sentence mandating, "both accused leave Caroline County and the state of Virginia at once, and do not return together or at the same time to said county and state for a period of 25 years." They got around it, recalls University of Georgia professor and family friend Robert Pratt, by riding back in separate cars and meeting up. As a child, Pratt would play with the Loving kids: Donald, Peggy and Sidney, who still lives with his mother. "Especially on summer nights, I would look for them," Pratt said. "Then I would hear my mother and grandmother start betting on how long it would be before Richard came along from the opposite direction." The frustrated young wife had written to then Attorney General Robert Kennedy, who referred her to the ACLU for help returning to their Virginia home permanently. Cohen filed a motion to vacate the 1959 sentence against the couple, but hit a dead end when the courts refused to respond. American courts had proven tough on race-mixing in the past: A handful of cases similar to the Lovings' had come up before in other places, but were stuck in a thicket of state-sanctioned racism and red tape. But lawmakers had just passed the Civil Rights Act, and across the South, blacks were defying Jim Crow's hold. Hirschkop was convinced the Supreme Court was ready for change, too -- but the right case had to come before the justices, free of any legal loopholes the state could seize upon. The Lovings presented just such a case. Hirschkop argued that laws must treat each citizen equally, and that "when a law is based on race, it is immediately suspect and the burden is shifted to the state to show there is a compelling interest to have that sort of racial differentiation." On June 12, 1967, the court agreed. "The country was ready, the Supreme Court was ready ... ," Hirschkop said. "They were going to do the right thing." Richard, by all accounts a stoic, blue-collar man content to let Mildred do the talking, moved his family into a small house on Passing Road, and tried to live happily ever after. That ended when a drunken driver struck their car in 1975, killing Richard and costing Mildred her right eye. The small cemetery where he is buried is a few minutes from their home. Over the years, Mildred has granted few interviews, letting others tell her story through books, articles and a Showtime film, "Mr. and Mrs. Loving." "Not much of it was very true," she said on a recent Thursday afternoon. "The only part of it right was I had three children." Her hands are curled by arthritis and her right eye, shielded by gold-rimmed spectacles, is just a lidded hollow now. Still, Mildred's face lights up as she talks about Richard. She thinks about him every day. Each June 12, Loving Day events around the country mark the advances of mixed-race couples. Mildred doesn't pay much attention to the grassroots celebrations, or to today's interracial pairings -- "You see so many" -- and she doesn't do anything special to mark the date of the Supreme Court ruling. "Just another day," she said, her hands resting across her long, floral skirt. "Sometimes I forget." Mostly she spends time enjoying her family, her two dogs, and the rich countryside she fought so fiercely to again call home. She wishes her husband was there to enjoy it with her. "He used to take care of me," said Mildred Loving. "He was my support, he was my rock."